Well, I'm back in the waiting game now. 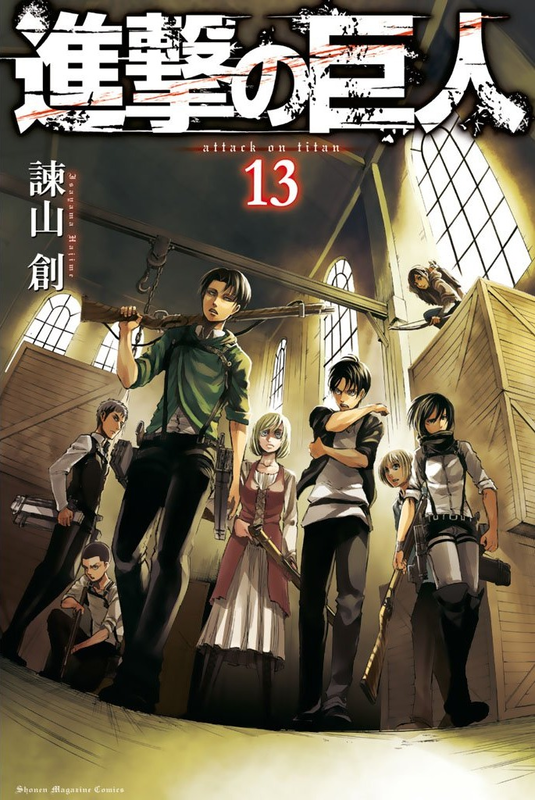 I have to wait until November to get the fourth volume of the wildly popular Attack On Titan manga series. Thankfully, there are the two spin-off series No Regrets and Before the Fall I can enjoy in the meantime. Both of which are prequels, with the former telling the backstory of Captain Levi. Although I don't think those will be able to touch the main series in terms of quality since they are not done by Mr. Isayama. However, Attack On Titan: Junior High might be able to overcome the shadow of its inspiration if only through sheer absurdity. First off, I just want to state how epic this cover art for this volume is. It reminds me of something out of a Quentin Tarantino movie. Or maybe The Usual Suspects. I think that this artwork really sells the way this series is actually perceived by the fans. Previous covers just didn't quite capture the sense of majestic awesomeness that it is capable of conveying. This cover tells you the gang's all here and looking badass. Of course, one of the main characters is in drag and holding a shotgun. So maybe badass isn't quite the right word. The last issue left off with everyone escaping the fight against the Colossus and Armored Titans with the exception of Ymir. If you recall, Ymir actually chose to follow Bertolt and Reiner for whatever reasons. Our heroes, in the meantime, are being forced to pick up the pieces after a fierce battle yet again. The Survey Corps is making Eren and Krista lay low because there's a very good chance they may be kidnapped again. Erwin is recovering from having his right arm eaten by a titan and the leader has never looked more frail, but he still has his metaphorical hands full now that Hange suspects that the village of Ragako was somehow transformed into titans. If you recall, that's the village where Connie's mother lived and where he found a titan that looked suspiciously like her. Hange's suspicion would also support the fact that there was no new wall breach that let the titans inside this time. With all of this stress, I'm a bit worried about Erwin. I'm also beginning to wonder what the connection between Eren and Krista really is. There are definitely some odd things going on here. Things only get worse for Erwin's stress level when it appears that the Military Police murdered Pastor Nick, the Wallist Priest that the Survey Corps had been trying to protect so they could get information. Not only that, but the conspiracy to retrieve Eren and Krista seems to go all the way up to the top of the food chain. The monarchy itself seems to be willing to sabotage the Survey Corps and the rest of humanity. Erwin's plan is now clear: The Survey Corps must overthrow the royal government. I really loved this volume because it focused more on the political intrigue than on the titan battles. While I have enjoyed the battles, the politics behind the walls are interesting in their own right and they kind of bring the series down to earth a bit. After all of the action, it's kind of nice to bring things to a more personal level and really get in touch with citizens again. With all of the badassery you'd almost forget that the citizens still consider the Survey Corps to be a waste of taxpayer money.